Though she's wide awake in class, Nika Pruitt doesn't get much sleep. The 29-year-old works a full-time job on early morning and overnight shifts to support her family. Then she goes to class at Malcolm X College from 8 a.m. to 6:30 p.m. on Tuesdays and Thursdays. Thankfully, there's no school or work on Wednesdays. But she still can't sleep. “I’ll be here, because the course load is pretty heavy. I'll be here every chance I get,” Pruitt said. The extra help comes from tutoring provided by One Million Degrees, or OMD for short. The nonprofit organization that's helping her navigate the community college system. “We have many students who work more than 40 hours a week, go to school full-time, taking 12 or 15 credit hours, they’re raising children or caring for their dependents. So, frankly, they are not sleeping all that much. That's the thing that goes. This is the daily reality of their lives,” said CEO Paige Ponder. Ponder explains that 10 years ago, the One Million Degrees founders recognized there were few supports for students working their way through community college. And in recent years, since President Barack Obama and Mayor Rahm Emanuel have highlighted the importance of two-year colleges, the need for a group like OMD has increased. “Our model focuses on the soft skills, which is sort of an unfortunate term – we like to call them foundational skills – of presentation, of communication, of being able to network, of really having your elevator pitch down, and having the confidence and being comfortable in those situations, so you can get those jobs and then move up in those jobs,” Ponder said. In addition, OMD provides tutoring, financial counseling, tuition assistance and stipends to help pay for much of what scholarships and grants don't pay for, like transportation, child care and at-home internet access. And the group's reach is extending: The number of OMD scholars is up to 700 from 440 last year at 11 community colleges in the city and suburbs. It's also set up staff offices on eight school campuses, instead of just four last year. Danielle McConnell is one of those on-campus counselors. In addition to helping students manage their busy lives, McConnell says sometimes her students just need to talk to someone who knows about college life. “They need someone who can support them through the transition of coming from maybe a background where no one in their family went to school, so they don't necessarily have someone at home to ask questions about the larger institutions, who to go to, what is financial aid, what’s the FAFSA. They don't always have the supports,” said McConnell. For some students, the goal is to go to work after graduating with an associate's degree – but OMD says 75 percent of its scholars transfer to four-year universities. “These are the strivers, they're pulling themselves to get ahead, and to do what society is asking them to do, to add value to the economy and be able to support their families long term. Why would we not want to give them every bit of support we possibly can?” asked Ponder. Long term, Pruitt hopes to attend Baylor University in Texas and eventually become a radiologist. “Because I’m very interested in photography, and I like helping people. So, what better way to match the two together,” she said. Before school, she worked two full-time jobs to support her mother and her younger brother. Now, she knows she has a long journey to reach her goals, but hopes her work ethic has proven she'll reach her destination. Almost all of One Million Degrees' scholars are eligible for the Pell Grant, or the City of Chicago's Star scholarship. The group also helps students find additional financial aid for enrolling at a four-year university later on. 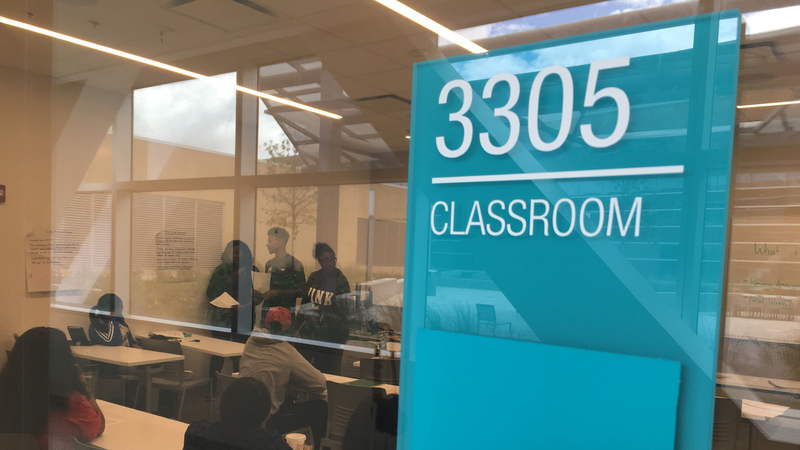 OMD scholars are attending all seven City Colleges of Chicago locations as well as the College of Lake County, Harper College, Prairie State College and South Suburban College. Oct. 21: One Illinois state representative hopes to stem the tide of rising student debt by making public colleges and universities free for all in-state residents. Oct. 17: Illinois students are outpacing the U.S. average, while Chicago Public Schools says its graduation rate is growing at three times the national rate.